If you are all set with your website and the products and services that you wish to introduce in the market, it’s time to take into account the marketing method that helps you follow the correct path. Among the availability of a wide range of marketing alternatives to choose from, you need to choose the one that assists in maximizing the benefits of your business. So, what promotional strategy would you choose to build your digital marketing campaign? Well, be it blogging, social media marketing, SEO, PPC, video marketing, or display ads, every strategy include a different target market, budget, and deadlines. So, how will you find the best framework that can help you deliver an effective digital marketing strategy for your business? 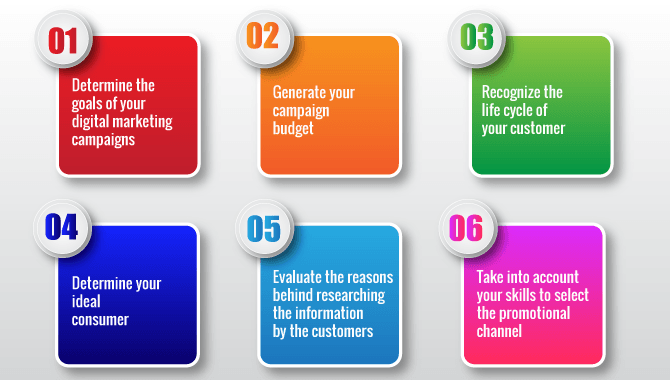 Here are the steps following which you can launch a successful digital marketing campaign. Begin by discovering the objectives of your digital marketing campaign. Examine your needs and see what you actually want to acquire. Do you wish to build new leads? Do you want to create brand awareness? Or do you wish to give rise to quick revenue? The marketing activities that you choose totally depends on if you have short-term or long-term goals. Some of the paid media strategies that you can incorporate in your business include PPC, Facebook ads, Display ads, guest posts, and video creation among others. So, all you need to do is analyze the goal of digital marketing advertising and see if you will meet your objectives in short-term or long-term. What type of marketing channel you want to use? Well, it all depends on the funds of your online marketing campaign. That being said, having a smaller budget will force you to make use of available content as well as resources. Alternatively, with a larger budget, you can outsource the required task and get it done by the experts that can assure you the desired results. So, examine the costs of your marketing campaign and find out the acquisition costs of the single lead and single customer respectively. Now is the time to identify the part of the life cycle at which your customers exist. Doing so will let you focus on your product messaging, thus allowing you to connect with the leads that you wish to acquire. That being said; examine the existing stage of customer life cycle, and then come up with a content strategy that allows the customer to move from one end to another. All you need to focus on is the buyer persona. Be it the marketing message of your product, or the channel strategy, you must take into account a central customer persona. By defining the job function that your consumer will meet, come up with the challenges related to your buyers. Follow the process by listing out the social networks used by your customers on a regular basis. Illustrate the objectives of your potential consumers, and list of the places from where your target customers will acquire their information. A customer often gets inclined towards a product or service through an event or any kind of marketing trigger. So, to promote your product to the appropriate target market, identify the events that facilitate your target customers to buy your product. So, all you need to do is define your target market as well as the marketing triggers that can influence all your buyers to go with your services. Identify the skills at which you are good at and choose your marketing channel accordingly. You must outsource the expertise which you do not possess. Yes! This will help you enhance the power of your marketing campaign. So, analyze your areas of expertise, set a start and finish date of your campaign, and follow the process by creating a budget and outsourcing expertise whenever required. Mamsys, one of the reliable digital marketing companies, takes into account all the significant steps by means of which one can launch a successful digital marketing campaign. ← What kind of services do IT staffing companies provide?